Black Sigatoka, the deadly disease of banana, is spreading despite the best efforts of the stakeholders of the industry. That fungal disease attacks banana leaves appearing as reddish brown streaks which lengthen and widen and then turn dark brown to black. Carol Severin-Abraham, Coordinator of the Black Sigatoka Disease Management Unit of the Division of Agriculture said she is "concerned at the continued spread of the disease." She said: "We have seen it in the South, to include Soufriere, South East; East -Castle Bruce and Carib Territory; North East - Concord and some parts in the heights of Marigot along with Central- Belles, Warner and Layou , Carholm area; there has been some sightings in the (Roseau) Valley -Fond Canie, Elmshall, Wotten Waven." She added: "In the East it has spread throughout the Carib territory to Concord… the disease was recently seen in plots in the heights of Marigot." Severin-Abraham said the infected plants found in Fond Canie, Elmshall, and Wotten Waven areas were "not big banana or plantain areas and farmers have been advised of the measures to take to reduce the incidence of disease." 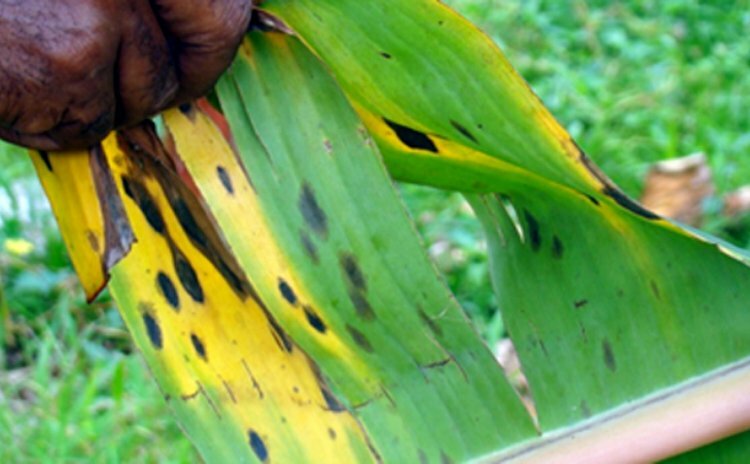 A Food and Agriculture Organization (FAO) release stated that Black Sigatoka disease is considered far and away the most destructive disease to bananas and plantains. The disease affects the leaves, severely impacting the plant's ability to produce fruit of good size and weight and causes premature ripening of the fruit, diminishing their export potential. The disease spores are carried by leaves and other planting material and as such can be spread easily from farm to farm and from country to country. It is hoped that with a comprehensive management plan and high levels of awareness both amongst commercial farmers and householders that Black Sigatoka disease can be controlled and eventually eradicated form the region, the FAO stated. Black Sigatoka was first discovered here in June 2012. Among management strategies undertaken since then are the monitoring of fields and determining spray cycles based on biological and climatic data. "Government has applied three spray cycles to date, spraying close to 1,500 plantain and banana farms. We have used Tilt, Bankit and Manzate in these cycles. The fourth cycle will employ the use of Volley", Severin –Abraham said. "Total acreage sprayed is approximately 2,500 acres and this includes bananas and plantains. We have noted an increase in plantain production in spite of the presence of Black Sigatoka and would like to caution farmers to ensure that they get their planting material from clean areas." She added: "We also want to appeal to farmers and hucksters to leave banana trash in the fields and not use them to cushion the fruit as the trash is a source of fungus and helps to spread the disease." The Ministry of Agriculture has conducted many training sessions for farmers and spray-men including a regional workshop funded by FAO for technical staff on the issue of biological methods to determine build up of fungicide resistance in the fungus.